How the story around the most influential piece of art of the 20th century just got rewritten. I was alarmed and thrilled at the same by an article I read this weekend in Dutch newspaper NRC Handelsblad (“Marcel Duchamp’s Lie”). The article states that Marcel Duchamp was not the creator of the artwork ‘Fountain’, which is truly seminal in the world of conceptual art. In the article, journalist Sandra Smallenburg convincingly sums up the different proofs that clearly point into the direction of Elsa von Freytag-Loringhoven as the work’s true creator. Even though the two artists were friends, Duchamp claimed her work to be his own after she died and thus “buried the reputation of one of the real geniuses of the early 20th century,” Smallenburg puts it aptly. I was alarmed because I’ve dedicated quite a bit of text in my book to Duchamp and ‘his’ urinal-turned-on-its-back, which means I have to make a few amendments in my next print! In any case, the article forms a great read – as if detective fiction. For example, one of the more significant pieces of the puzzle in favor of Von Freytag is the famous signature “R. Mutt 1917” on the urinal, which Duchamp claimed to be his own pseudonym. According to Irene Gammel, a professor at the University of Toronto, ‘R. Mutt’ phonetically means ‘armut’ (poverty) in German. Poverty was the state Von Freytag lived in and German her native language. 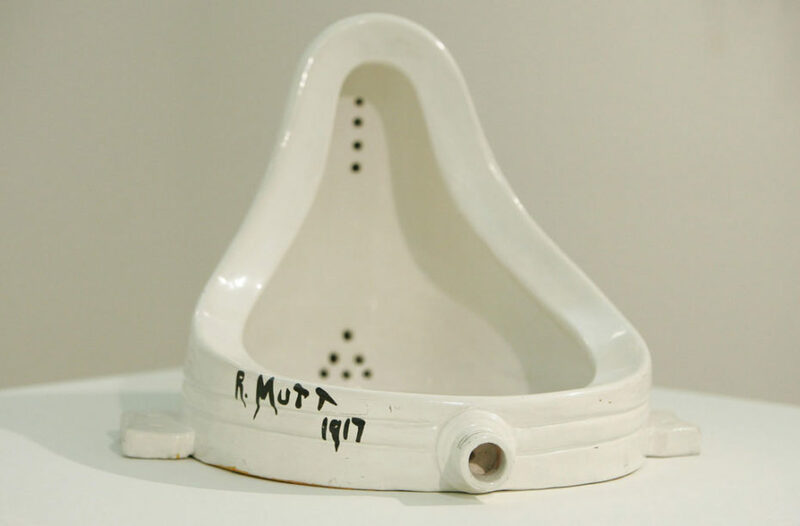 Duchamp had always claimed that the signature was inspired by the shop where he allegedly bought the urinal (“J.L. Mott Iron Works”). But this shop was actually not a shop (but a showroom) and J.L. Mott didn’t even sell this type of urinal, the British art historic Glyn Thompson found out. Duchamp’s very first ‘Readymade’; Bicycle wheel. Photo credit: Jean-Pierre Dalbéra (on Flickr), taken at the Fondation Louis Vuitton, Paris. The article even plausibly states that Duchamp was greatly influenced by Von Freytag’s objet trouvés (found objects). In 1913 Von Freytag already created ‘Enduring Ornament’, an iron ring she found on the day of her wedding. 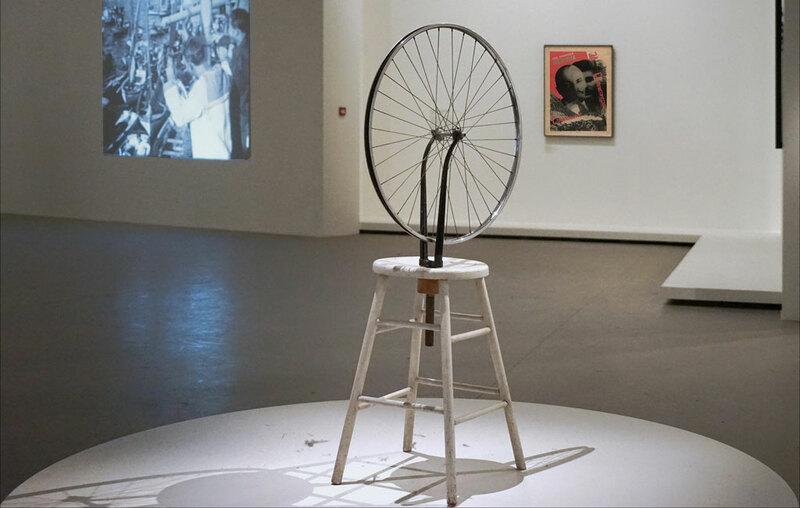 Duchamp created his very first ‘Bicycle wheel’ in the same year, but only years later he dubbed it a ‘Readymade’ – he even claimed the work was not purposeful at its conception, he simply liked looking at it. This would mean that Duchamp’s ‘Readymades’ were based on Von Freytag’s earlier work. Which not just means that a landmark of 20th-century art should be subscribed to Von Freytag, but also that she is the godmother of conceptual art. Another alarming injustice in this whole story is that much of the proof against Duchamp already existed for quite a while. The reason why it has always been ignored by a large part of the established art world is rather banal – and as the article suggests even sexist. Museums such as the Centre Pompidou, the Tate Modern, the San Francisco MoMa and (as I’ve seen for myself) the Philadelphia Museum of Art all have a replica of Fountain – there is a total of 17 (!) replicas. Art dealers and museums have paid large sums for these works. The Tate, for example, paid half a million dollars for a copy. These ‘businesses’ thus has a vested interest in the whole Duchamp hype; if the work would suddenly be credited to a relative unknown – and female – artist, its value might plummet. This shows how the art world is ruled by money. It also shows, for that matter, how the experts in the art domain are ironically quite conservative – and even sexist maybe. The reason, however, why I was not just alarmed but also a little thrilled by the news, is that the story seamlessly fits within the domain of conceptual art. After all, the essence of conceptual art is that the idea of a piece of art is more important than its visual representation. Conceptual art is thus all about the imagination of the artist (and his/her audience). What we know now is that Duchamp went beyond using a found object; he used someone else’s found object. But he went further than that; since the original Fountain disappeared shortly after it was conceived and since he authorized a great number of replicas to be produced in the 60s – decades after Von Freytag had passed away – Duchamp might have even prevented Von Freytag’s original story to silently disappear. In that case, Duchamp revived Von Freytag’s story and made it his own. Don’t get me wrong, what Duchamp did was extremely unethical, but it was also imaginative and therefore conceptual without a doubt. In fact, now that Duchamp has been exposed as a fraud for turning a found object into a stolen one, the story has become more layered, more ambiguous and therefore more interesting. And if this is true, the art world doesn’t have to really worry about the value of their replicas. They can credit Von Fretyag for creating the original – and for being the founder of conceptual art – and they can maybe credit Duchamp for reviving the original or at least catalyzing its exposure. 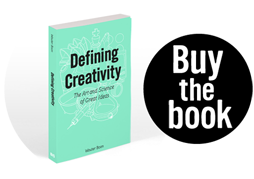 The first conceptual collaboration in two parts – without consent. That makes quite a story. A story that could make Fountain an even more valuable piece of conceptual art. The article in NRC Handelsblad was based on an article by Dutch journalist and author Theo Paijmans, who last Friday published a story in art magazine See All This, titled ‘The urinal is not Duchamp’s.’ With this article he calls upon the art world to rewrite the story around Fountain. In another article on this blog I describe how Duchamp claimed he had submitted the work to an exhibition of the avant-garde movement and how it was denied for being “immoral, vulgar, plain piece of plumbing.” Now we know that it was most likely Von Freytag who submitted the work.